Salford Red Devils ran their 2015 Summer Camps from the Langworthy Reds facilities in Oakwood Park, Salford. The cheque, totaling £520, was presented to the club comittee and kids during the Salford Reds vs. Sheffield Eagles on Sunday. 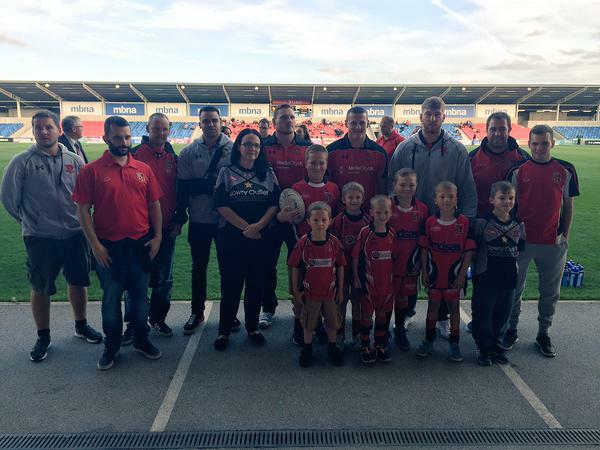 Mark Davies, A spokesperson for Langworthy Reds said: "This was a great and very kind gesture from the Salford Reds team. We provided the facilities for the recent Summer Camps and it proved very successful. It is brilliant to be involved in the local community and helping out local young people." The Salford Red Devils Foundation would again like to thank Langworthy Reds for allowing us to use their facilities, we hope this partnership will continue for a long time as we carry on putting back into the community. For more information about our work within the community, contact 0161 786 1591 or follow us on Twitter @SRDFoundation. Find us on Facebook, search ' Salford Red Devils Foundation.